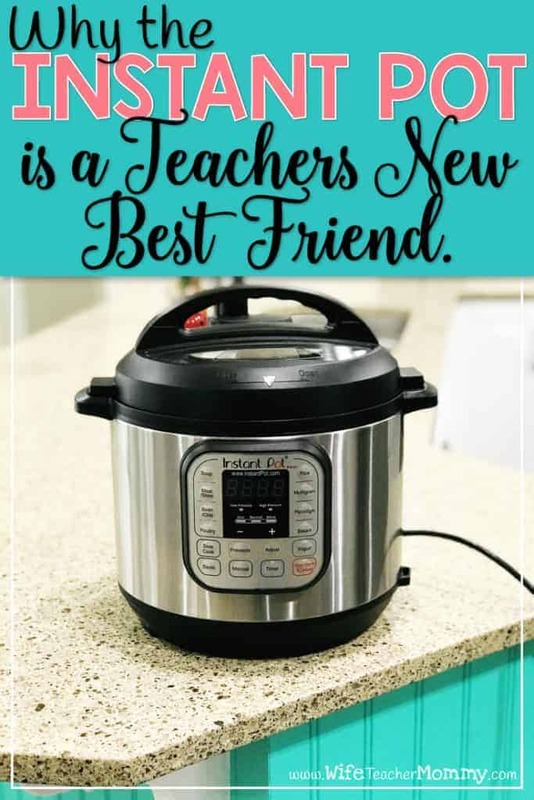 Inside: Why every teacher should own and use an Instant Pot! Well, for the most part, that struggle is over. I have found something that WORKS for me… and now I want to share it with you, in hopes that it’ll help you as well. It’s called the Instant Pot. The Instant Pot is an electric pressure cooker. It cooks your food by putting it under intense pressure… and it cooks it quickly! It also has many other features- such as rice cooking, slow cooking, and steaming. Some models even sanitize and make yogurt. But I mainly just use it for pressure cooking (and occasional rice). There are so many reasons I love the Instant Pot. 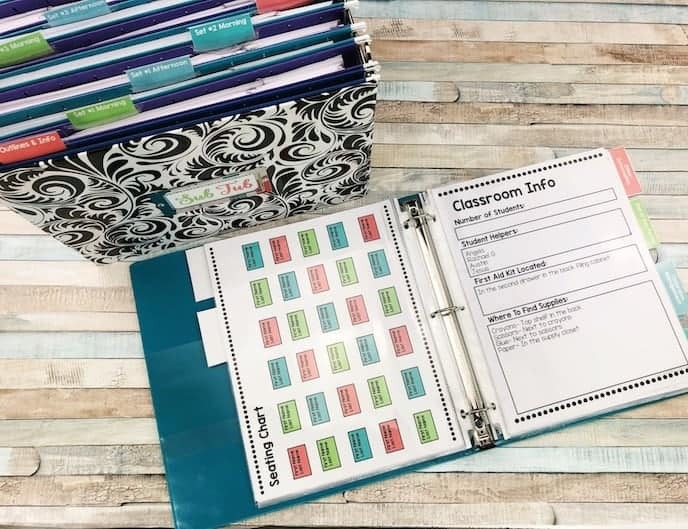 Let me explain why it is a teacher’s new best friend. I love that I can throw everything I need into the pot for a meal and have dinner ready in less than an hour (sometimes, quite a bit less, depending on the recipe). Imagine taking your slow cooker, but having it cook 6-8x faster! That is what the Instant Pot does. 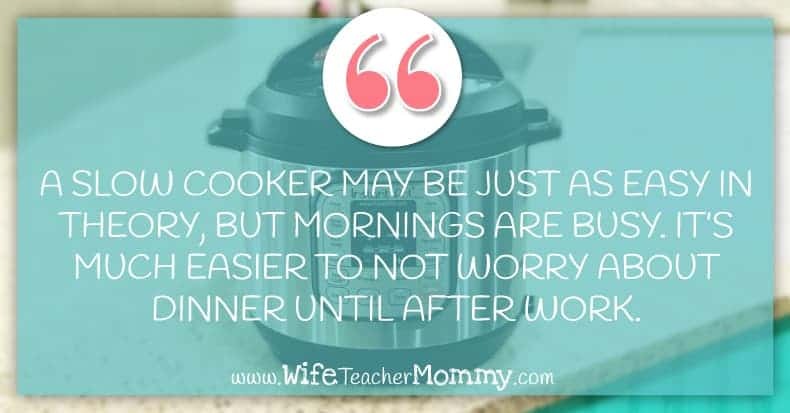 Instead of having to throw everything into the pot during your already hectic morning, you can wait until the evening and just do it shortly before dinner. A slow cooker may be just as easy to use in theory, but mornings are busy. It’s much easier to not worry about dinner until after work. 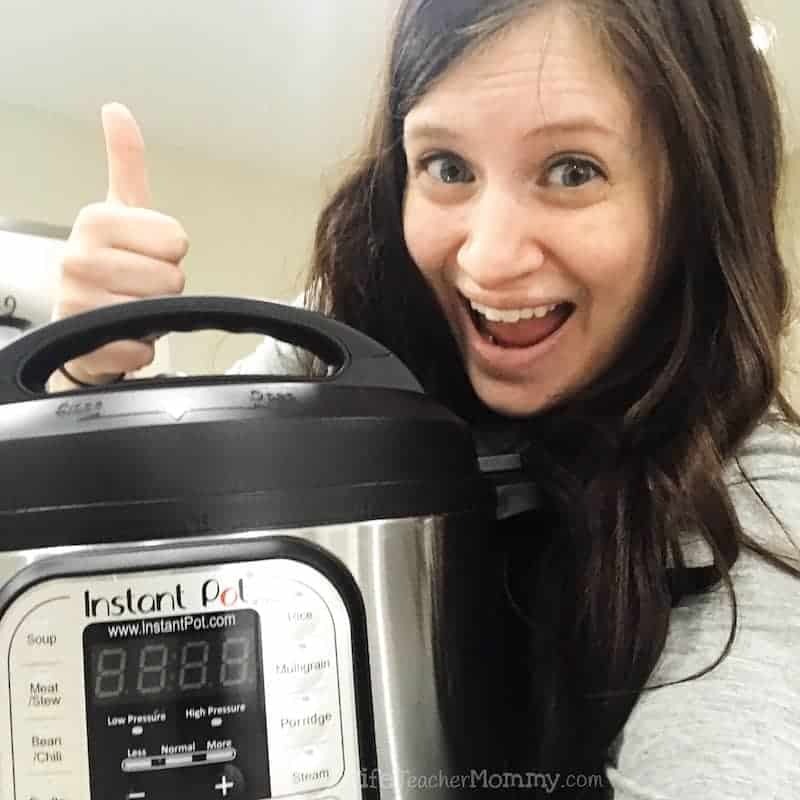 The Instant Pot is a huge hit in the food blog world. That means you can find a TON of Instant Pot recipes easily on Google and Pinterest. I’ve compiled a Pinterest board with some of my favorite Instant Pot recipes here if you’d like to check it out. I like to keep things simple sometimes, too. Here’s an example. One of my absolute go-to recipes in the instant pot is Salsa Chicken. It’s 2 ingredients (I bet you’ll never guess what they are? 😉) Just throw some chicken breasts and a can of salsa into the pot and cook it on high pressure for 15 minutes. And… done! Serve with tortillas and make tacos or eat it with rice. One of my favorite things about the Instant Pot is that it is set-it-and-forget-it! Once you turn on your pot, you are FREE until dinner is ready. 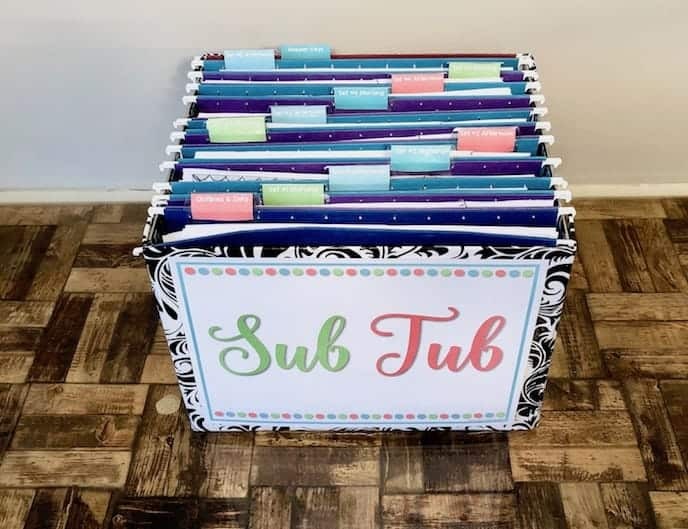 Help your kiddos with your homework, grade some papers, or just wind down a bit after a long day at school. When the pot is done, enjoy your delicious dinner! Make Dinner Even Easier with Freezer Instant Pot Dinners! I recently joined Once a Month Meals and LOVE it. This site helps you build a menu for the entire month, and you can do all of your freezer cooking in one day. 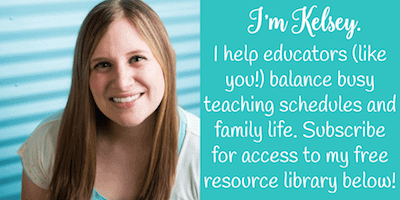 They provide the recipes, shopping list, labels, and more. But the best thing is- it is customizable. You can remove recipes you know your family will NOT eat and add other recipes you love. The shopping and prep lists automatically adjust to your changes. 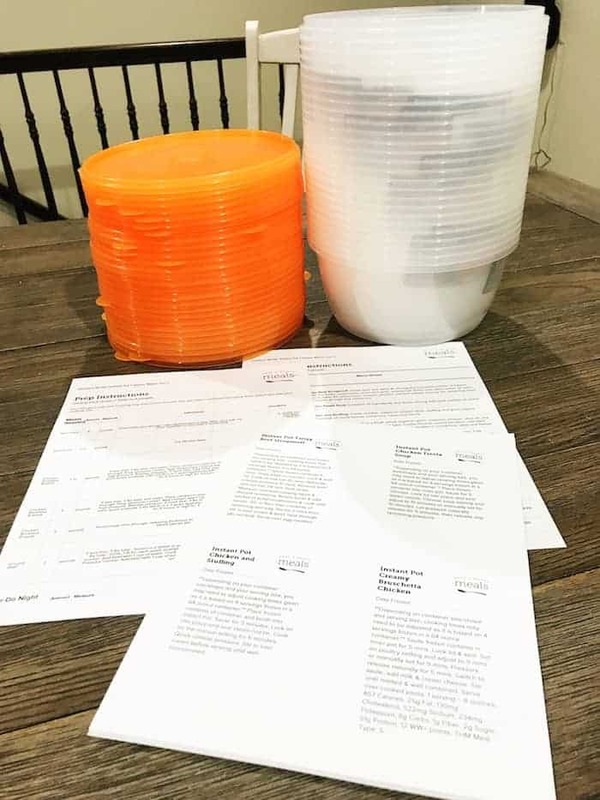 Put your freezer meals in round containers like this, and they are ready to go into your Instant Pot. With the Instant Pot, you can cook meals directly from frozen. That means with these freezer meals, you just stick it in the Instant Pot, follow the directions to start it, and then wait for it to cook your dinner! It has made dinner so much easier for my family. I’ve found that it’s lasted me longer than a month as well- because we like to do lots of other simple dinners, too, so that stretches how long we can use our freezer meals. If you do try their meal plans, I have found that I have to add about a cup more water than their recipes tell me in order for my pot to come to pressure. You will need to test this out with your own Instant Pot, but I recommend adding a bit more water. If you’d like to try out Once a Month Meals, click here! They even have a free mini menu offer if you scroll to the bottom of their site. The Instant Pot is the Best! Do I have you convinced yet? If so, you can grab your Instant Pot right here on Amazon! I promise you will not regret it, because it will make dinners so much easier. What will you be cooking in your instant pot? Do you have any favorite recipes? Share them in the comments below!